In our last issue we featured health care and in this issue we look at aged care. Aged care (and health care) in Australia are becoming increasingly important as the number of elderly people in the community continues to grow. Over the years Secon have worked on numerous aged care projects and has the experience to assist in the provision of the necessary extra aged care facilities. We would like to welcome our two new Modellers Chris Lenden Barnes (Mechanical and Electrical Services) and Isaac Finley (Hydraulic Services). Two Secon staff members - Matthew Fechner (Senior Consultant - Hydraulic and Fire Services) and Andrew Burrow (Senior Mechanical Engineer) will be riding in the Juvenile Diabetes Research Foundation JDRF 2013 charity ride to raise funds for research and awareness for those families with kids with type 1 diabetes. This is a personal journey for Matthew as his daughter was diagnosed with type 1 diabetes on her sixth birthday last year. Matt and Andrew's team is called '1000 Needles' (which is the number of insulin injections Matt's daughter will have in her first year of care). They have set a team goal to raise $5,000 for this event. Matt's personal goal is to raise as much money as he can to help find a cure. So far we have raised over $4,400.00. If you would like to make a donation please click on this link http://ride.jdrf.org.au/1000Needles/ select '1000 Needles team', the riders name and donate. A tax receipt will be generated and emailed to you. Please call Matthew if you require any further information or have difficulties with the site please let me know. The Australian Standard (AS/NZS:5033) for Photovoltaic arrays was updated in July 2012, superseding the original 2005 publication. The Australian standard sets out general installation and safety requirements for photovoltaic (PV) arrays, including direct current array wiring, electrical protection devices, switching and earthing up to, but not including energy storage devices and power conversion equipment or loads. - All direct current cabling located within a building, visible or concealed, including supported by cable tray, must be protected by heavy duty conduit. - All direct current cabling located externally to a building, exposed to the environment must be protected by medium duty conduit. - New earthing and bonding requirements. - New documentation requirements to be included in the photovoltaic system manual. - PV panel orientation and tilt requirements. - All direct current isolators must be non-polarised type with one located adjacent the roof array and another located adjacent the inverter. Inclusion of these requirements into a typical domestic photovoltaic system design could increase the overall budget allowance by $2,000.00. On Tuesday 30th October Engineers Australia is hosting a one day workshop in Adelaide on the chnages introduced in the new version of this compulsory standard. Further details can be obtained by contacting us, or Emily Yiannakis at Engineers Australia. Modifications to existing and new wings for aged care incorporating dementia wing and kitchen upgrade. Secon are providing Mechanical, Electrical, Electronic, Hydraulic, Fire Sprinkler and ESD services. 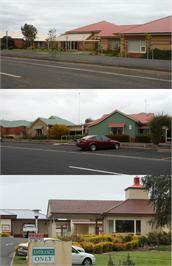 Modifications to existing hospital and extension to 4 aged care accommodation suites. Secon provided Mechanical, Electrical, Electronic, Hydraulic, Fire Sprinkler and ESD services. New aged care facility including administration, kitchen and laundry. New residential wing with modifications to existing building including administration. Secon provided Mechanical, Electrical, Electronic, Hydraulics, Fire sprinkler and ESD services. New age care wing attached to the existing Cummins Hospital. New aged care wing and modifications to existing and new wings to provide additional aged care. Residential housing for the aged including on site housing for staff members. Extension to existing retirement village. Redevelopment of existing Pioneer Village Dementia Homes. New dementia wing to an existing nursing home. 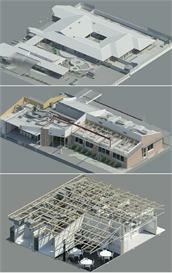 Extension and refurbishment of existing nursing home. Water reticulation and fire design and documentation for 28 allotments in the community title retirement village. Refurbishment and upgrade to an existing nursing home. Modifications to existing hospital and new extension to the aged care accommodation suites. Well done to Stewart Caldwell from Russell and Yelland Architects who won the Caption Competition in our last newsletter with "we use the latest surveillance technology to seek out defects in our buildings." The runners up were Chris Mantle from Chris Mantle Electrical Contractors' who came up with "So thats how they make 'behind the scenes' footage" and Lindsey Williams of Williams Architects who came up with "Don't look behind you, we're being watched"
This issue's photograph is a rather interesting shower/toilet arrangement. 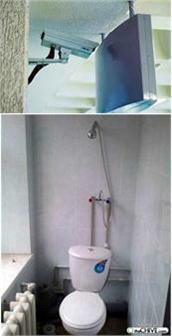 A bottle of wine is the prize for the person who comes up with the best humorous caption for the toilet/shower image.